It was then known as South Wiltshire Intervention for Trauma started by Malcolm Russell a military doctor whose aim was to foster links between civilian & military immediate care in South Wiltshire. Here due to the Army presence there was the potential for civilian doctors to be called to military incidents but more importantly there were a number of well trained & committed military doctors regularly posted to the area. Malcolm & his colleague David Sutcliffe began Wiltshire’s Immediate Care Scheme. In 1999 Dr Neil Meardon met Malcolm. Both were full of enthusiasm & Neil subsequently became the scheme’s chairman for the following 10 years. Some lean & some plentiful years as far as both staff and funding went. Through Neil’s dedication & ability to fit 20 years work into the 10 years he held the chairmanship Neil brought the organisation out of the noughties very much fit for the purpose of modern Immediate Care with links, training & communications to carry it through the next decade. In 2009 there came an opportunity to grow & gain status as a registered charity with the charities commission. This obviously required more work than one doctor could do and Drs Adam Brownhill & Jonathan Glover took over as joint chairmen. South Wiltshire Intervention for Trauma had for some years been offering a county-wide response including Swindon & the M4 corridor in Wiltshire. Two Members were called to London at the time of the bombings in 2005 and there were more members who were formally trained in the medical management of major incidents and mass gatherings such as the Summer Solstice at Stonehenge. 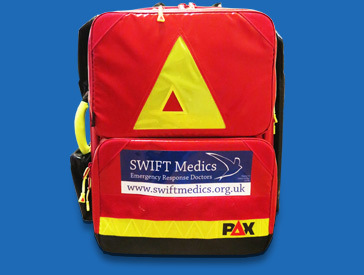 It was therefore decided to change the organisation name to SWIFT Medics retaining the original initials & familiarity but relinquishing the ties to South Wiltshire alone. We are a group of doctors who volunteer our time and specialist expertise in pre-hospital emergency care to the people of Wiltshire, Swindon and Bristol.